Promising investigative work in hearing and balance. Thanks to the generosity of many individuals and organizations, HHF funded nine Hearing Restoration Project (HRP) projects and 14 Emerging Research Grant (ERG) recipients last year. Meanwhile, our ERG recipients (pp. 19-22) were awarded grants to fund their up-and-coming work in the areas of Ménière's Disease, tinnitus, central auditory processing disorder (CAPD), hearing health, Usher syndrome, hearing loss in children, and stria vascularis. Introduction of a research program, Ménière's Disease Grants (MDG). HHF funded two former ERG recipients, Drs. Gail Ishiyama and Ian Swinburne, who will help to advance our understanding of the inner ear and balance disorder Ménière's Disease. These grants (p. 23) were generously supported by a family committed to finding better treatments and cures for this disabling condition. Preview of our exciting Hearing Loss Survey findings. HHF, in partnership with the Hearing Loss Association of America (HLAA), surveyed 2,300 people to understand how to better serve the needs of the hearing loss community. Affordability and accessibility of hearing healthcare was an underlying trend in the responses (pp. 11-12), and participants overwhelmingly support the government playing a role in access to hearing loss treatment. A full survey manuscript and executive summary will be available in April 2018. Thank you to all our fundraisers and donors. We were fortunate to receive large-scale support from Cantor Fitzgerald Charity Day, marathon runner Catherine McLoughlin, and the De Francesco family. You can read about each on pp. 8-10. Additionally, you will find a complete list of our FY’17 donors on pp. 26-36, who all helped make a difference in hearing loss research. Continued outstanding financial transparency. HHF retained top marks from all charity watchdogs (BBB Wise Giving Alliance, Charity Navigator, CharityWatch, and Guidestar) and was recognized, for the second consecutive year, as a “Best Charity for Your Donation” by Consumer Reports. Examine our Report’s Financials on pp. 37-39 for more information about how we efficiently steward donor dollars. Should you have any questions about the report, please get in touch with us at info@hhf.org. To learn more about naming a grant and other giving opportunities, contact development@hhf.org. If you are able to help us fund research programs in 2018, we encourage you to make a contribution to HHF before September 30, 2018 to see your name included on the list of donors in next year’s Annual Report. Hearing Health Foundation (HHF) is happy to announce that its 2016 annual report is now available. The report is an in-depth review of our activities, events, and achievements for fiscal year 2016. We are very proud of top marks from top charity-rating agencies and even more proud our audited financial statements. We are fortunate to have such generous supporters who raised funds to further HHF’s mission of prevention, education, and research. Check out our supporters' creative and unique fundraisers; if you feel inspired and would like to organize an event of your own, please contact us at development@hhf.org. Successfully disrupted gene expression in the adult mouse cochlea, including capturing high-quality images—necessary for testing genes in regeneration. Confirmed that the “DTR mouse” is an excellent platform for studying ways to stimulate hair cell regeneration in the mammalian inner ear. HHF awarded nine Emerging Research Grants (ERGs) to early-career scientists who are pursuing projects in the areas of Central Auditory Processing Disorder (CAPD), Hyperacusis, Ménière's disease, Stria, and Tinnitus. Through ERG, we hope to uncover better treatment options and deeper understanding of these disorders. Last but certainly not least, we want to express our gratitude and appreciation for our many donors; because of their support, we were able to continue with our important work. To see your name on our next donors’ list, we gladly welcome and appreciate your gift in any amount made by Sept. 30, 2017. Hearing Health Foundation (HHF) is pleased to announce that our 2015 annual report is now available. 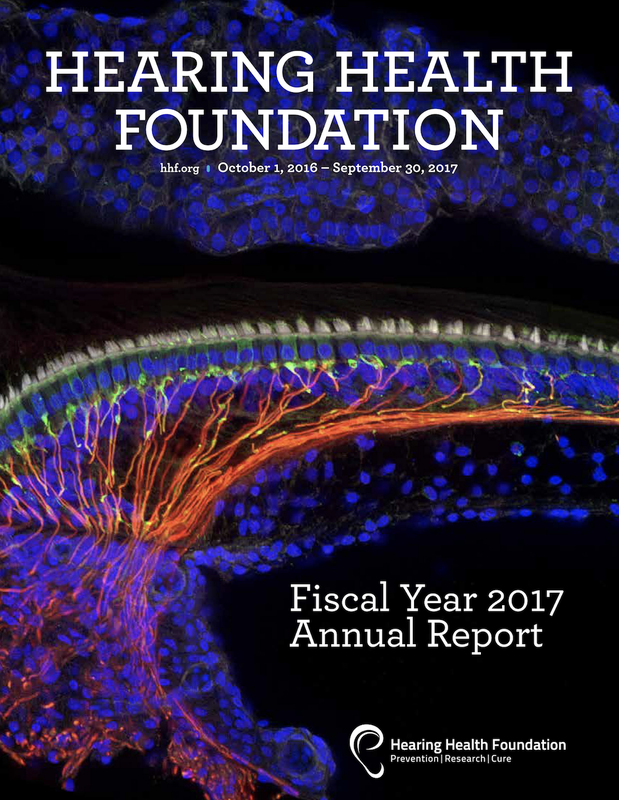 From the latest hearing research to how we have worked to fulfill our mission, the report is a comprehensive look at our programs, events, and activities for fiscal year 2015 (Oct 1, 2014 - Sept 30, 2015). Check out the incredible supporters who ran, hiked, and hosted events all to benefit HHF’s mission! HHF’s Hearing Restoration Project (HRP) consortium of researchers made notable strides in hearing and tinnitus research. In 2015, the HRP designed a model to test candidate hair cells for regeneration in deafened adult mice, and that’s only a fraction of the story. HRP researchers like Andy Groves, Ph.D., thank you. “Federal funding for biomedical research has decreased by over 20% since 2003, and it shows no sign of increasing any time soon. Your support is critical to help support the skilled young scientists in my lab and to keep the lab afloat,” he says. HHF awarded ten Emerging Research Grants (ERGs) to innovative scientists in the areas of Central Auditory Processing Disorder (CAPD), Hyperacusis, Ménière’s Disease, and Tinnitus. Learn more about what they are doing with their research grants. See if your name made the donor list. Didn’t see your name...make a gift by Sept 30, 2016, to be listed in fiscal year 2016’s annual report. Keep your eye (or ear!) out for hearing-related facts and statistics. Get all the details in the full report here. We are excited by our progress over the past year and hope you enjoy reading it. As always, have any questions, please email us at info@hhf.org!